"We have to protect the wand!" 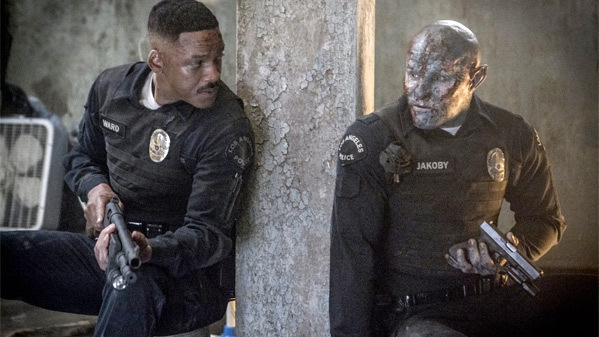 Netflix has debuted another new trailer, officially the third one following a teaser and another full trailer, for David Ayer's new fantasy action cop movie Bright. This Netflix Original production, starring Will Smith, is set in a world where other creatures like orcs and elves co-exist with humans. Joel Edgerton co-stars under the make-up as "Nick Jakoby", who is assigned to him as his new partner. The cast includes Noomi Rapace, Kenneth Choi, Brad William Henke, Lucy Fry, Edgar Ramírez, Ike Barinholtz, Brandon Larracuente, and Dawn Olivieri. This trailer reveals some very cool fantasy elements that haven't been shown in full before, and I've got to say, this still looks damn good. You can still watch the teaser trailer for Ayer's Bright here, plus the second trailer or BTS featurette.